Today, the financial system is regularly going through changes, but the users are not typically the ones to benefit. 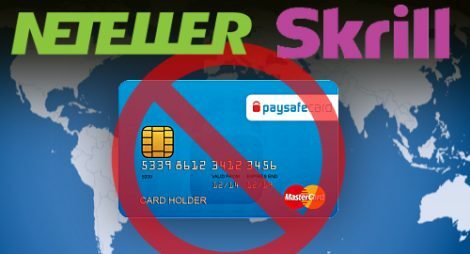 From a few days ago, the popular online payment options, Skrill and Neteller, will prohibit the use of prepaid MasterCards in over 100 countries. Some experts believe that this shift will most likely lead to a wider acceptance of Bitcoin. Continue reading our article to find out more details about this financial alteration. Since Friday, November the 25th, Skrill and Neteller will no longer accept the use of prepaid MasterCards in over 100 countries worldwide, as we mentioned above. The Paysafe Group currently holds the control of both of these brands and has just informed their users about the approaching change. This change in policy will not affect the SEPA zone, which includes each and every country in the European Union, alongside Lichtenstein, Monaco, San Marino, Norway, and Switzerland. Prepaid MasterCards were quite popular among online punters who use either Skrill or Neteller to fund their online casino accounts. However, the clients will no longer have the option to withdraw from their ewallets. Though, Paysafe’s users will still be able to withdraw their funds to a bank account as well as transfer cash to a different Neteller or Skrill account. This alteration will also make an impact on several of the biggest gambling nations in the world, such as Brazil and Australia. So far, this change will not apply to the users located in North America. On the other hand, clients from China and Russia can keep using these cards. However, when their cards expire, they will not be reissued. Check out our reviews page for reliable casinos and other available payment options.